Humidity and Temperature - Dial w/ Black Face & Brass Case. 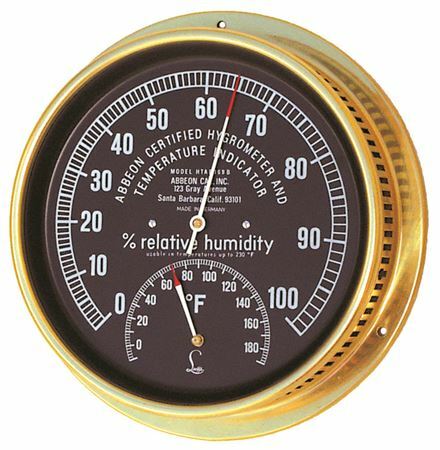 The HTAB-169 Hygrometer is certified to be accurate within ±3% RH + 1 scale division. The dial indicates the complete range of 0 to 100% relative humidity. Each instrument has been tested for accuracy at 3 points on the scale for high, medium and low readings. The calibration and certification are done under ISO-9001 control. The bimetallic thermometer on the model HTAB-169 is accurate to ±1% of scale and has a range of -10° to 190°F. Gradations are 1% RH and 2° Fahrenheit.